Breeders describe the Scottish Fold as an “owl in a cat suit” due to its folded back ears, big, expressive eyes and smiling grin. 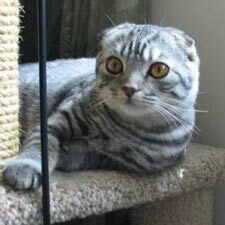 Scottish Folds are round in many ways: face, body shape and whisker pads. Their thick, resilient coat comes in both shorthair and longhair lengths. This breed comes in virtually every color and pattern except solid lilac, chocolate and color pointed. All Scottish Fold kittens born with straight ears and in a month, some evolve into folded ears. To obtain the folded ears, one parent must carry the folded-ear gene because straight-eared folds do not carry this gene. Females weigh between 6 and 9 pounds and males average between 9 and 13 pounds. Never overly demanding, the soft-spoken Scottish Fold welcomes laps slightly more than games of fetch. They simply enjoy your company and revel in spending time with you. This laid-back breed does not get startled easily and makes for a good travel mate or hostess when you wish to have company. This breed also likes other cats, dogs and even children. It is common for this breed to suddenly flop on their backs and go into a sound sleep in this position. They won’t take offense if you regard them as catty couch potatoes. If you have a longhaired Scottish Fold, be prepared to comb his coat three or four times a week to maintain a mat-free, healthy look. The folded-ears tend to build up wax and need to be cleaned at least twice a month. The story of the Scottish Fold takes place in the Tayside Region of Scotland in 1961 when a shepherd named William Ross spotted a white barn cat named Susie with ears folded forward and downward at a neighbor’s farm. She looked like a cuddly owl. He adopted a white kitten from Susie’s litter and later bred that cat to local farm cats and British Shorthairs. These litters led to the foundation for the Scottish Fold breed. Since the 1960s, Great Britain’s Governing Council of the Cat Fancy (GCCF) banned Scottish Folds due to unfounded concerns about ear health and deafness. Even though it has been determined that this breed is not more prone to deafness than any other white cat with blue eyes, the Scottish Fold is not recognized as a breed in Europe. Now ranked 17th in popularity among the CFA-recognized breeds, the Scottish Fold was granted championship status in 1978.